Techniques for collecting, handling, and preparing small molluscan specimens. Geiger, D. L., B. Marshall, W. Ponder, T. Sasaki & A. Warén. 2007. 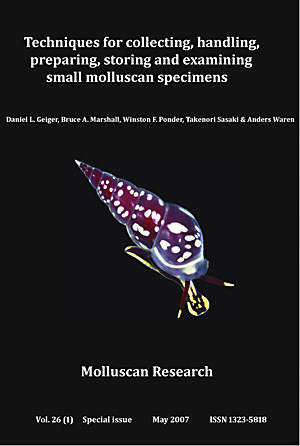 Molluscan Research 27 (Special Issue): 1-50. Micromolluscs are small-sized molluscs (< 5 mm), and include the great majority of undescribed molluscan taxa. Such species require special collecting, sorting and handling techniques and different storage requirements to those routinely used for larger specimens. Similarly, the preparation of shells, opercula, radulae and animals poses some challenges for scanning electron microscopy (SEM). An overview of experiences with various techniques is presented, both positive and negative. Issues discussed include those relating to storage of dry specimens and interaction of specimens with glass, gelatine and paper products, handling techniques and storage in various fluids. Techniques for cleaning shells for SEM are described and compared, as well as those for radular extraction. The interactions of chemicals used for the dissolution of tissue with calcareous micromolluscs are described. Methods for handling and mounting small radulae for SEM are detailed and brief guides to SEM and light photography are given. An appendix listing details of frequently-used chemicals is provided.